By Friday, I was getting pretty worried! Here in Atlanta we've had a pretty severe gasoline crunch. It hasn't been as bad as the problems in Tennessee, but it hasn't been pretty, either. People have reported waiting in lines up to forty minutes long for gas, stalking fuel tankers, and even seeing owners of small stations carrying shotguns. It was a mess by anyone's standards, and I was afraid it would mean no patrons at the show. While it wasn't the highest-grossing show ever, we actually did pretty decently, given the circumstances. Unusually for me and my partnership with Art of the Firebird, who makes awesome beads, I was the top seller of the pair of us. I think my style is just "fall like". I need to find a way to translate that into spring and winter shows, though! One of the things that helped all of us is that, while there were six lampwork booths at the show, not one of us had precisely the same style. Some people, like Dogmaw, had things that nobody else had--her shank buttons were wonderful! And no matter if you make tonnes of money, make nothing, or something in between, it's always fun to do a bead show. We got to talk with other vendors that we see infrequently, and see what's out there, and just hang out with some very cool people. 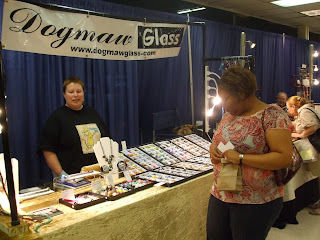 Dogmaw of Dogmaw Glass was next to us, and we had a fine time. What's not to like? 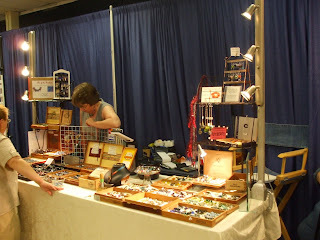 Here are some pictures of our booth. Note the new lights that Frostfire's husband made! As I wrote yesterday, I'll be at the Down the Street Bead Show this weekend, with Dogmaw of Dogmaw Glass and Frostfire of Art of the Firebird. We're looking forward to a great show! The last few weeks I have been busy creating more beads and bead sets, and I have some that I am very excited about. One of the things that a friend does in the last few days of creative time before a show is to spread out all her inventory by organizational idea, and see where the "holes" are. If you display by color, make sure you aren't overdoing the blue to the exclusion of the yellow; if you display by shape, make sure the lentils or the rounds aren't edging out the other styles. *Making sure all my beads are properly inventoried, priced, and tagged. *Packing my show suitcase--beads, business cards, receipt books, change envelope, tools, displays, pens, tape, extension cords, extra light bulbs, and what-have-you. *Washing the tablecloth and reapplying fire retardant. Frostfire's husband has built us some better lights this year, and we have bought a banner! As she has obligations at her full time job until after the show has already begun, I will meet her later this afternoon and pick up the lights, the table topper, the banner, the credit-card machine, the bed risers for raising the table, the display pieces that she keeps, and her beads. I will get everything set up in time for the show's opening, and she will join us when she can. There are going to be some wonderful vendors at this show, so I am looking forward to a fun-filled weekend! And the next weekend, I will be in the Rail Arts District of Scottdale (between Decatur and Clarkston), at Amalgam Arts, for their Sunday Trunk Show. See you there! This semester has been really kicking my hiney, and I have been appalling at keeping up with blogs, Etsy, work, and Justin ... and, when the chips are down, Job / students and beasties come first. DOWN THE STREET BEAD SHOW! The doors open at noon on Friday, and close at six on Sunday. 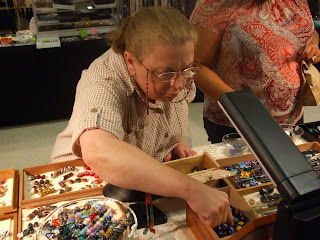 You can get a dollar-off coupon at The Down the Street Bead Show site. I hope to see everyone there! I'll be there with Art of the Firebird, and Dogmaw Glass. I'll have flower disc beads, lots of frit beads, new organic focals, and lots of kittehs. Come stop by and say hello!